Why are these microbeads so harmful? Microbeads are just one of many forms of microplastics that are now sadly invading our oceans and having a detrimental impact on oceanic wildlife. They are manufactured for use in various household and commercial products, such as toothpastes, exfoliating face washes and foot scrubs. Normally our water filtration systems would sieve out the particulates that leave our bathroom basins, but microbeads are just too tiny and manage to slip through these filters unnoticed, wreaking havoc on our aquatic environments. How do such tiny particles manage to have such a massively detrimental impact on our seas? Well, the problem is that these tiny plastic beads will never decompose. Like all plastics, they are destined for a life of permanence, stubbornly hanging around in our environments, absorbing toxins, gradually breaking down into smaller and smaller pieces but never fully dissolving or disappearing. Unfortunate fish can often mistake these floating plastic particles for food, resulting in damage to their digestive systems when they are directly ingested, then causing subsequent damage to birds and other animals when these fish, in turn, are eaten. No creature is safe in this plastic food chain. But it’s not all doom and gloom. As with most problems in life, a positive first step in conquering this plastic problem is awareness. We can all play our small part in halting environmental disasters such as this. Collectively, like the tiny microbeads, we can have a massive impact. We can use our new-found knowledge and raise awareness to speak out against companies that manufacture these products. Our role as a consumer in our modern society is arguably the most powerful tool we have. If we want change, we can collectively make change happen. 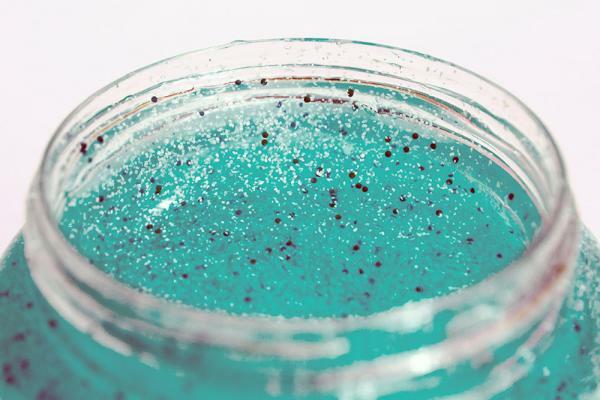 So, can you think of any products that you use in your daily life which may contain these microbeads? (Tip: Check ingredient lists for polyethylene and polypropylene - both of these are plastics. For a comprehensive list, you can consult the ‘Good Scrub Guide’ here.) Maybe you’d like to think about alternative products, or even get creative and make your own ‘sea-friendly’ beauty products at home using natural materials such as oats or nut shells? Find out how FreshWater Watch partners, Alliance for Great Lakes, helped to get microbeads banned in New York state. Please feel free to share in the comments section below if you have any recommendations… We’d love to hear your ideas!